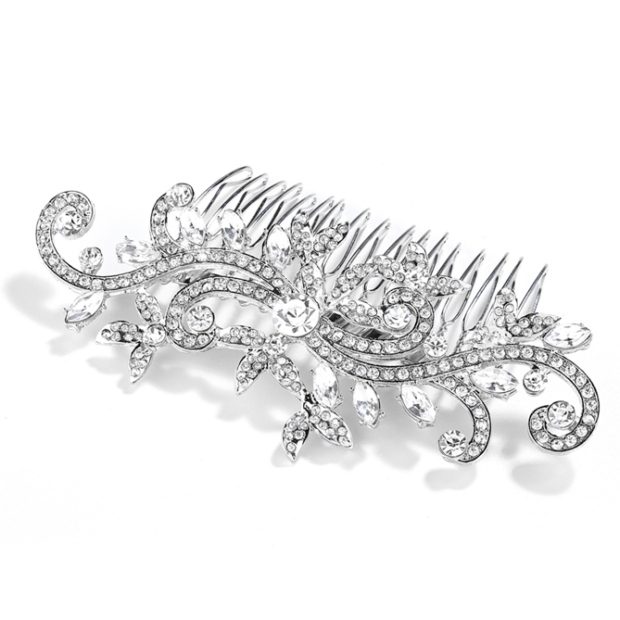 * Mariell's popular Bridal Hair Comb is 4" w x 2 1/4" h with Pave Crystal Vines. * This hair comb has fabulous versatility to wear with the hair up or down. * Create spectacular hairdos for Weddings, Proms or Homecomings at an excellent wholesale price! * Mariell's dazzling crystal wedding or prom comb is the latest in bold headpieces creating "jewelry for the hair"! * This vintage silver rhodium hair comb gives your customers a glamorous headpiece at an exceptionally affordable wholesale price! * Order this best-selling Hair Comb today for your bridal, pageant, homecoming and prom customers. * This hair comb is one of our editor's favorites and we're sure you'll find it to be an instant hit! * We also offer this comb in Gold tone as style 4027HC-G.